Find all of the Fated Blades novels at Powell's, Barnes & Noble, Amazon, and Audible, or from your favorite neighborhood bookstore. The newest addition to the saga of the Fated Blades is the novella Streaming Dawn, an e-book exclusive available for any platform. There is no place the Wind cannot reach. Visit Powell’s, Barnes & Noble, Amazon, and Audible to order the Fated Blades trilogy in paperback, e-book, or audiobook. Don't forget the companion novellas, Only a Shadow and Streaming Dawn, available from your favorite e-book seller. When Tokyo falls victim to a deadly terrorist attack, Detective Sergeant Mariko Oshiro knows who is responsible, even if she doesn’t have proof. She urges her commanding officers to arrest the perpetrator—an insane zealot who was just released from police custody. When her pleas fall on deaf ears, she loses her temper and then her badge, as well as her best chance of fighting back. Left on her own, and armed with only her cunning and her famed Inazuma blade, Mariko must work outside the system to stop a terrorist mastermind. But going rogue draws the attention of an underground syndicate known as the Wind. 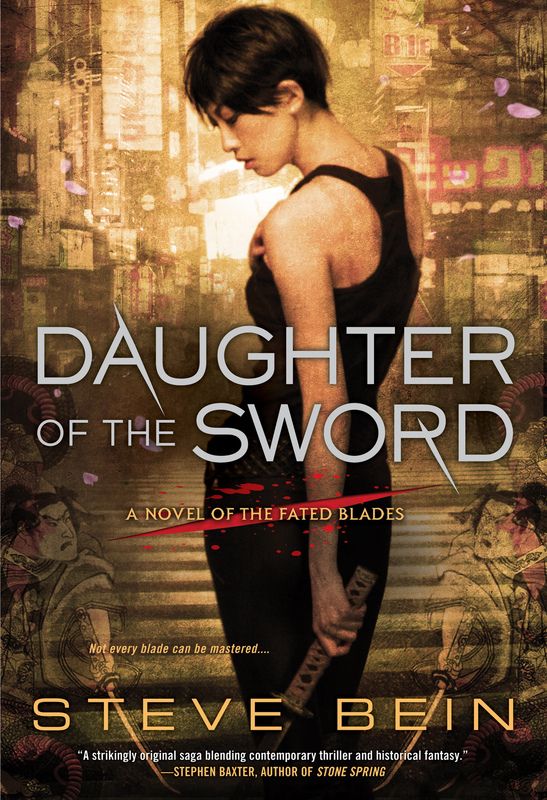 For centuries, they have controlled Japanese politics from the shadows, using mystical relics to achieve their nefarious ends—relics like Mariko’s own sword and the iron demon mask whose evil curse is bound to the blade. Now the Wind is set on acquiring Mariko. Mariko is left with a perilous choice: join an illicit insurgency to thwart a deadly villain, or remain true to the law. Either way, she cannot escape her sword’s curse. As sure as the blade will bring her to victory, it also promises to destroy her. Read the first two chapters of Daughter of the Sword for free! Bein's gripping debut is a meticulously researched, highly detailed blend of urban and historical fantasy set in modern Tokyo. Detective Sergeant Mariko Oshiro is fighting an uphill battle against sexism and tradition in the narcotics division of the Tokyo police. Her antagonistic boss assigns her to a mundane case involving the attempted theft of a sword, but it gets a lot less boring when Mariko winds up on the trail of a ruthless killer. As she learns the hidden history behind a trio of ancient magical swords, Mariko discovers that she may be destined to wield one of them. Alternating segments switch between Mariko's present-day adventures and other owners of the swords throughout history. Bein's scrupulous attention to verisimilitude helps bring all the settings to life, respectfully showcasing Japan's distinctive cultures and attitudes. An eBook companion to the Fated Blades series. Available on Kindle and Nook. The Tiger on the Mountain is a legendary blade, crafted by Japan’s greatest sword smith and reputed to possess magical powers. In 1442 Japan, the sword dwells inside the impregnable fortress of Hirata Nobushige, sworn enemy of the Iga clan. Venerable shinobi Iga Jujiro has recruited a brave young ninja named Tada to steal the sword and restore power to the Iga clan. If Tada is successful, he’ll go from being the clan’s orphaned ward to a legend for the ages—and he’ll win the right to ask for Old Jujiro’s granddaughter’s hand in marriage. If he fails, the clan faces annihilation. Getting inside the castle is next to impossible. Getting out is inconceivable. But as Tada prepares himself for one of the boldest thefts in history, the greatest obstacle he faces may just prove to be himself.